4Xlounge is no longer providing service to retail traders. WARNING!!! Do not use any of 4XLounge products. Including the new site 4xedge. They are a total rip off. I signed up for 3 months, used the software for 2 weeks before giving up. They look good on the youtube videos but in live trading its rubbish. Lots and Lots of false signals. The members chat area is dead, no one is on it. There are various methods (all very simple) but they are all so similar they dont work. To top things off they have since billed me another 3 months even tho I canceled my subscription, I had 3 very nice Emails from a guy called Chuck because I opened a dispute on Paypal, he then assured me he would refund me if I closed the dispute, But since closing the dispute over a week ago he has ignored all my emails. Total scam , AVOID at all Costs. Fraz is correct. No response from Dan Campbell about the promised refunds. He has now re-named this thing 4XEdge. Months on and still no response to my refund request, seems Dan is trying to scam more people using 4xedge.com. Dan you lost all of my account the least you could do is refund my subscription fees. 2013-06-24 1Star JBL is absolutely correct. And before you respond saying you don’t have any customers with this name, yes you do or at least you did and if your having trouble remembering then I can post my payment here? As far as the good feedback goes here, its all from fictitious people who I never came across in my year at the 4xlounge forums/chats or newbies that haven’t even experienced the service yet! For what it's worth. I received an email today that he is selling the forum. Not saying good or bad, just saying. Helll Paul, Our forum doesn't have anything to do with our paid services. I'm selling the forum because I do not have time to manage it. Our forum has 1000's of active users. It's too much for me to deal with right now. The signals were great if you filtered them, but they are now a thing of the past. The tools work, period. They are amazing, and will help traders see what is going on underneath the markets, and with help from the site and a plan enable anyone to become consistently profitable. Got an email from Dan after I left the review on 10th of July, saying I was #23 in the refund queue. Still waiting to be paid after 3 weeks. Still a one star unless the promised refund is honored. 2013-07-10 1Star I had been with 4xlounge since 2010 and for a period of time they were doing well with their RoundTable signals. However since July 2012 their results started to deteriorate and it is true that Dan Campbell (now the sole owner of the website) has blown at least 4 accounts since last year. Today with FOMC minutes and Bernanke's speech he is again in huge drawdown. You can see that on his myfxbook page now (which he will probably take down again soon). His trading style is counter-trend which works most of the time when the market is quiet but when the market is trending he can easily lose more than a few thousand pips in a short period of time. I have been asking for refund for my 5 year deal which was $1899 when he blew the his Oanda account as he guaranteed money back if drawdown exceeded 40%. It has been over a month and he has still not refunded my paypal account. I don't think he has the intention to and I would actually label him a scam except I am too lazy to go through all the process of providing proof, etc. Just don't sign up with him as he will just take your money, blown up your account and not refund you. You have been warned!! As I mentioned in our last 4Xlounge Newsletter, we have a que for refunds. I cannot refund everyone at once without closing 4Xlounge. You are currently on that que. I plan is provide refunds to everyone that submitted a request. However, if you would like to be removed from that que, I would be happy to do so. When I first started 4Xlounge I never intended to offer trading signals. 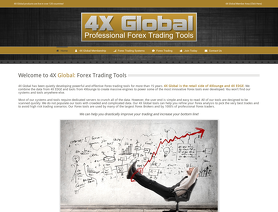 I simply wanted to offer useful tools for traders. However, somehow over the past few years, 4Xlounge has become a glorified signals service. I spend most of my time answering questions about our EA and/or justifying my trading. It’s exhausting and I am running out of steam. Most of our original 4Xlounge Pro Members (from 2007) don’t use and don’t care about our trading signals. They never have, but they do need our tools. As I've promised our Pro Members, 4Xlounge is not going anywhere, but I am making some changes. 4Xlounge will no longer offer trading signals. However, if you are a “current” Pro Member (as of this posting), you can still use our 4Xlounge EA to follow my trades. I will leave our Myfxbook page open for tracking. I would ignore Fraz. He is a complainer. You can view his posts on the forum. He is just a negative person. 4Xlounge is what you put into it. Their tools are excellent. I think their signals will be fine again. They had a very short period of bad results. I've been with them for more than 5 years. Give these guys a chance. They are not a scam. I concur wiht Frazs cooments as i used 4xlounge around the same period. Simply terrible - at one stage when Dan incurred a large loss he recommended everyone to 'dont worry - double your lot size - we will win it back" . I see in June he failed yet again to follow his own rules (i.e never move your stops). Unfortunate! Thanks for the response. We need to address several points, so this may be a longish post. But it is important. Looking back over the various 4XLounge threads here on FPA, there seems to be a pattern. If there are any complaints, then Campbell says that they can’t know anything since they are not paying subscribers. However, if they are current Pro members, then he asks for their Id before editing their forum posts, and canceling their accounts. However, I know and partner with, several traders that have been members for some time. They are very upset and I see their live accounts, so that point is not relevant. But it does seem to annoy him that he cannot control these FPA comments too. After almost two weeks, the 4XLounge MyFxBook live tracking account (#533267) has been now bought back online, for which we are grateful. It shows a drawdown, after about nine weeks, of 93.44%. The real trading account started with about five thousand dollars. It doubled in two months, before achieving a complete wipeout in just one day, all with the Cambell recommended risk leverage. We have copies, but view it soon, since it may be removed after the switch from Onanda over to to another Fx Broker, (for no apparent reason). Then there is the ForexPeaceArmy tracking account. It is true that we don’t know the mechanics of how this is turned on/off. Perhaps FPA can explain? The FPA account matches very closely to MyFxBook, as it should. ForexPeaceArmy now shows a max account drawdown of 92.09% (from the last day). After running for 9.3 weeks, Max Equity used 40.99%, Gross P/L -97.19% & Average Pips/Week -67. Please take a look while it is still up. Is 4XLoungePro really disputing these two sets of independent, confirmed live-account-tracking figures and accounting? Until a few days ago, the 4XLounge website, on the paid Signal EA Performance page, still showed a nice healthy equity curve. No mention there of the catastrophic drawdown that killed so many of their client accounts (again). Now, of course, that web page is gone too. So much for the claimed transparency. Why don’t they have the courage to post their own real (claimed) results, so the users can see the Cambell version of what happened? And another 4XLounge page has now been removed. The one that offered a FULL REFUND of any subscriber fees after any drawdown of 40% or more. (Again, we have saved prints of the page). Perhaps that explains why he has just posted this false “38% drawdown” figure here on ForexPeaceArmy. So that he can attempt to justify withholding those refunds. Dan Cambell, please confirm for the record that you will immediately refund the subscription payments for any 4XLoungePro members that make the request, without equivocation And that you will not cancel their accounts or delete their forum posts, but will keep them open of the same duration, as a measure of an apology. Here is a partial list of those who Cambell blames for his latest disastrous drawdown. His loyal Clients for over-leveraging - even though they were using the same recommended leverage as him. The Fx Broker Onanda for excessive re-quotes - but an account does not drop 92% in one day due to a few bad fills. The MyFxBook technical problems - really? Independent ForexPeaceArmy account tracking - no reason given yet. Who does he not blame? Himself. He takes no responsibility for anything to do with this fiasco and seems angry when anyone dares to raise questions. Then there is the plan going forward. It would be nice to believe that he has learnt his lesson and will revise the signals and systems to avoid such disasters in future. Not much use to those followers who have had their accounts destroyed of course, but something. He talks of avoiding stacking trades more than three deep in future etc. But after seven years of using these systems, why wait until now for that obvious precaution? Then he indicates a collaboration with one of the best, and most forthcoming, traders on the 4XLounge system (Kevin). But there has been no confirmation whatsoever on that. Besides, their methods are very different. More smoke & mirrors, or the truth? 2013-06-07 1Star Something is very wrong here. See what you think. The latest performance tracking verification charts on MyFxBook for the 4XLounge signals generated by Dan Cambell starts on the 5th April 2013. It did very well until this week - Wed 5th June 2013 - when there was a catastrophic drawdown. At 15:33 Someone pulled the plug on the MyFxBook live reporting half way through that swan dive (it had already reached minus -50% for the day on it’s way to -93%). Three days later Saturday it has still not been restored with no explanation. Lets see if their MyFxBook account is updated to show the truth or blocked soon. (We have prints from today). Their latest FPA live account tracking verification also started on the 5th April 2013. But it was deliberately turned off by 4XLounge at 20:37 on the same 5th June 2013 with several trades still open and running negative. By then the live account DD was already at about -60% and dropping fast. Hope it stays up for a while so you can see it. Surely that should cause some questions or a review? It also says they have nothing to hide. But I have seen many 4XLounge forum posts deleted over the last few days. Anything that mentions this latest disaster or questions their results is removed. Try it yourself. So much for those claims of honesty. Sad to say because I liked these guys but it seems to be yet another dishonest nasty scam. Please look at the facts closely before posting a review. 1. I explained very clearly in our email that our Myfxbook account has not updated due to a Myfxbook issue. You can read on their blog about the issue. Myfxbook is pinging too many brokers, so they are getting blocked by some brokers. We will NOT delete our Myfxbook account. We are just waiting for it to update. This exact same thing happened a couple of weeks ago. 2. I have NO control over our FPA tracking account. If they took it down, they probably didn't feel that we qualify for their tracking. I honestly have no idea. We did have a 38% drawdown and our EA opened extra trades on our tracking account. If I was FPA, I would have pulled it down too. 3. Our 4xlounge.com results page is a Myfxbook widget. Refer to the answer posted under #1. The widget will not update until Myfxbook updates. It's clear from your post that you are not a 4Xlounge member or you would have received our email. Please stop posting about services that you've never used.